It is a well-known fact that meeting minutes are the most important part of any meeting. Board meetings are typically where important decisions are made, and if no notes are taken, then there is no record of the discussions and decisions that took place during the board meeting. Learning how to take minutes at a board meeting does not have to be a daunting task. It is important that the minutes of the board meeting contain pertinent information about the meeting as well as summarizing the discussions and decisions made. If you are learning how to take minutes at a board meeting, then using a meeting minutes software like MeetingBooster can simplify your efforts. Learn how to take minutes at a board meeting with MeetingBooster! A board meeting will have specific requirements, and it is important when learning how to take minutes at a board meeting that you address these 4 key elements. 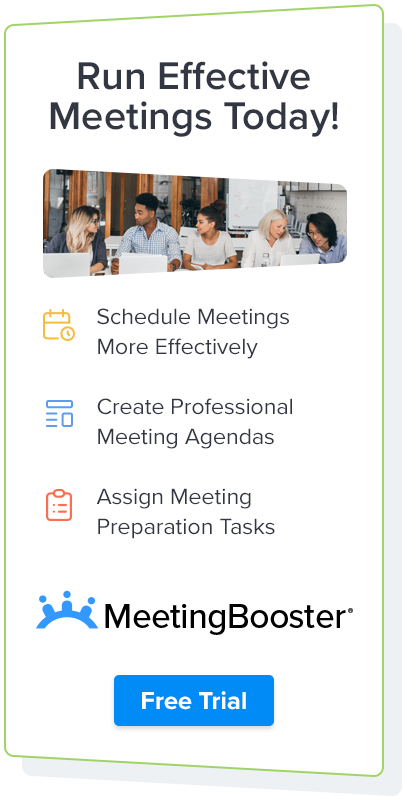 Use MeetingBooster to streamline your board meeting requirements! Of the three styles of minutes, discussion and verbatim are the most popular when determining how to take minutes at a board meeting. Discussion minutes are the most common style of board meeting minutes, and as with any style, it is important that you accurately document who says what regarding each agenda topic. As the meeting progresses, the note taker must continuously capture all important information covered during the board meeting, including side discussions. This can make the process of how you take minutes at a board meeting difficult, which is why the use of meeting minutes software is becoming more popular. Programs such as MeetingBooster help note takers to accurately enter notes based on a formalized agenda. When a topic is selected for discussion, the corresponding attendee making a comment can be noted and any decisions made can be documented. Formalizing, distributing and archiving meeting minutes can be the most difficult stage when learning how to take minutes at a board meeting. This process can be tedious when using traditional programs like MS Word, due to redundancy in that the note taker must re-type the captured information into a more formalized meeting minutes document. This is not only technically difficult, it is extremely time consuming. The board meeting minutes must also be easy to distribute and archive, so file management management adds to the hurdles. When using meeting minutes software, this process is automated. Board meeting minutes are created using professional layouts, capturing all important information and organizing it in an easy to review format. Note takers can distribute the board meeting minutes to attendees and teams with a few clicks and the documents are archived for future access and review. Optimize how you take minutes at a board meeting now!